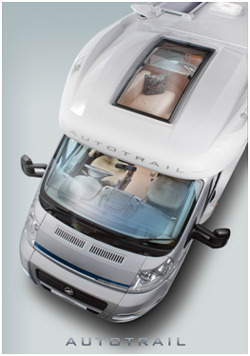 Auto-Trail’s new Super Low-Line roof style has been grabbing a great deal of attention since its launch at the NEC in October. The sleek front end for the company’s larger motorhomes, which incorporates a car-style sunroof and still has storage areas to each side, brought immediate orders from customers at NEC and these have been followed by more sales at individual dealer launches to introduce the 2011 models. The move to a lower roofline was among a raft of major changes and minor, but important, specification improvements in the 2011 model year line-up from the company recently named the best among the major motorhome producers in the UK. The new Super Low-Line is available on all Tracker, Apache (except 634) and Frontier models but also heralded the arrival of a totally new model, the Dakota, which shares its chassis with the existing Savannah but has a bathroom with large shower cubicle across the rear, French-style bed to the nearside, centre kitchen, and two bench seats as standard. As well as the Super Low-Line roof, it will also be offered with the previous Auto-Trail High-Line or Low-Line roof styles. The sleek, low profile, streamlined body of the Super Low-Line increases the visual dynamics of the range but reduces the frontal area, allowing owners to potentially see an improvement in fuel consumption. While the roof becomes more streamlined with the new model, interior width increases by 87 mm to give vital extra space on Tracker and Apache models. Locker redesigns improve access and capacity while lengthening of Scout and Delaware models allows for 6ft single beds at the rear of the Scout and enhanced living space in the Delaware. Other external changes for 2011 include fitting the distinctive Frontier style rear end, with covered spare wheel, to the Tracker and Apache models which now have a recessed awning and cab air conditioning as standard. With an eye to the ever-increasing demand for “green” vehicles, Auto-Trail’s 2011 models have new electrical and charging systems compatible with solar panels while “double din” radio / CD / DVD players with a 7 inch touchscreen and built in Freeview are part of the £999 media pack. After the addition of dark grey body colour to Excel models, which boosted their success by increasing their visual distinctiveness, a total refresh for 2011 brings new exterior colours and graphics along with revised interior trim that includes a new leather option. “I was confident the new look with the Super Low-Line roof would appeal to buyers and the number of orders backs this up,” said Scott Stephens, general sales and marketing manager for Auto-Trail. “Its reveal at NEC was a huge success and dealers have been reporting a similar enthusiasm at their own events during the late autumn. “Producing motorhomes in the UK is important for great number of jobs among manufacturers, their suppliers, and dealers and innovative touches like Super Low-Line ensure we stay at the front of the field. Auto-Trail will be on stand 3160 at NEC, where it will display Tracker, Apache and Frontier models with the Super Low-Line shown on Mohawk, Dakota, and Comanche variants. We have the Autotrail Apache 632 and we took delivery in Feb this year. The media package was well worth the money and the camera scheme for reversing is superb as for the low line roof looking at the stars and the light in a dull day is wonderful. I personally think that the new super low line is great from the outside,but inside I find the wood colour offputting as I would prefer a neutral colour as in the swift vans. I have a super low line Delaware _its light and allws plenty of air flow without opening windows its great to look up from the lounge at the night sky.